You are viewing the #1 muscle site enhancement oil on the planet – The Synthol™ (Synthrol 877 Formulation) . Created from the inventor himself in 1985, this Synthol formula created a buzz like no other site enhancement product in history. You wanna know why this Synthol is different than any other one out there? BECAUSE IT WILL BRING THE STRENGTH GAINS!! Yes, you heard me, not only can it produce better size and definition results than any competitor Synthol, BUT THE MUSCLE IMPROVEMENT IS REAL ! Until now, there has never been a muscle enhacement product created that will improve strength. With the right regimen, the gains will be massive and instant……..after 20 days of use the strength gains will come on very fast. Finding the right regimen is a must. Gains may continue for up to 30 days even after the use has stopped ! Uunique Synthrol 877 formula is completely safe, sterile, ph balanced,properly sterilized and properly sealed by a certified lab staff. 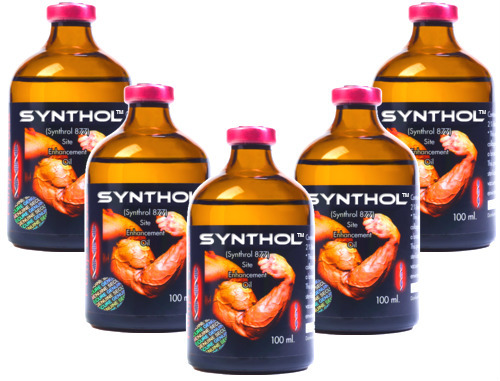 Find out for yourself why Synthrol 877, the most revolutionary product sold anywhere. Muscle Labs USA Supplements, 1 of 5 worldwide distributors of this unique product. Very hard to come by. We will only ship within the USA but we can refer you to an overseas distributor if you reside outside the country. We are fully authorized to sell this product. Safety Warning Pregnant or lactating women should avoid use of this product. Please consult your physician prior to starting any exercise or nutrition program. Keep out of reach of children. Store this bottle tightly closed in a cool, dry place away from direct heat, moisture and sunlight. Legal Disclaimer: Statements not yet evaluated by the United States Food and Drug Administration. This product not intended to diagnose, treat, cure or prevent any disease. * All liquids sold for topical use only unless directions for use specify otherwise. It is very disappointing when your biceps and other body muscle will not grow fast. Every man wants big guns for his shirt sleeves to fit tight around his arms. Additionally, the vascularity in the biceps, easily seen if you have big biceps. Smart people fed up with their biceps size go for some magic treatment. That magic treatment is known as synthol. Synthol can make you feel confident as you appear larger after use, you can see that your biceps are bigger and stronger like many professional bodybuilders. Synthol™ has many benefits to bodybuilding. Firstly, it helps to save the time you spend in the Gym; The synthol oil rapidly increases the size of your body, leaving you with a perfect body size that you have always dream of, and making you like your favorite bodybuilder, without you spending the entire week at the gym. Synthol gives you muscles that are permanent and not fading away after few weeks of not doing your work out. Synthol remains in the muscle enough for the fascia to stretch. As synthrol dissipates, “space” created by the synthol is replaced with new muscle tissue growth, if the user is in a proper anabolic environment. This is an enabling environment for muscle growth, strength training, i.e., proper nutrition, recovery and supplementation. Not waiting for years before you start seeing results. Result almost immediately, within a couple of weeks if proper dosage taken. You will start seeing your biceps muscle, triceps muscle and calve grow amazingly.